Usually, the word Sport in a boat’s name is code for a model that’s been stripped of standard features to hit a special price point — not so in the case of Berkshire’s Ultra Series 25 Sport RFX9. 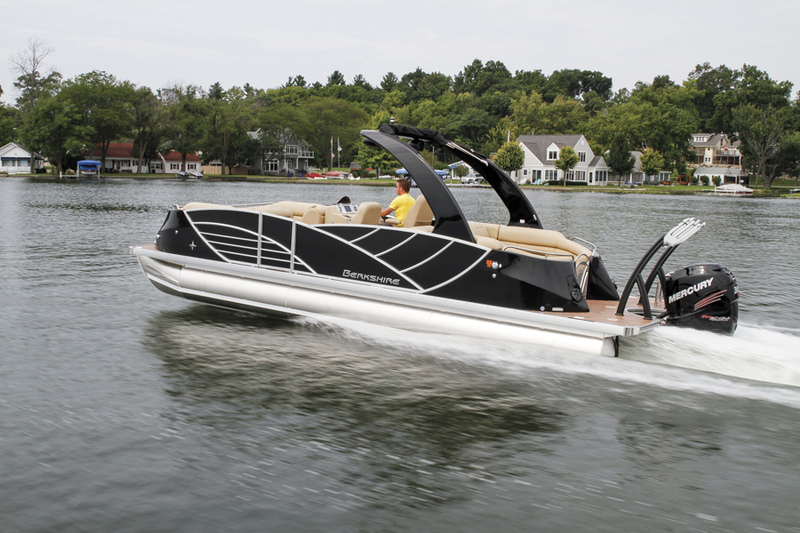 Perhaps a better name would be Uber Sport, because one would be hard pressed to find another pontoon with more high-end standard features. It has some edge to it, with features such as a color-coordinated curved ski tow that has built-in board racks ($1,703), artfully melding form and function. Its signature standard feature is an aluminum Sport Arch that electronically folds down to limbo under bridges or garage entrances. 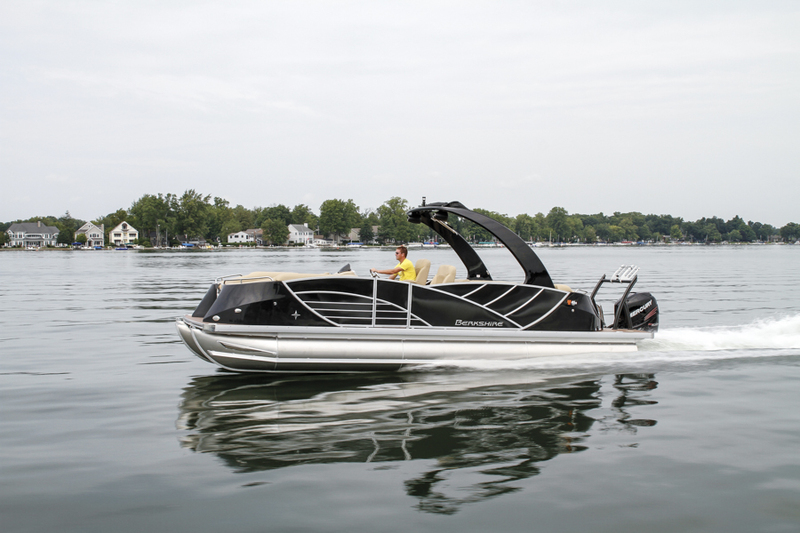 It features a high tow point for wakeboarders and has a Bimini top that casts a wide swath of shade. And for ski storage, there’s a 79-inch-long in-deck locker ($1,750). The rear deck is wide open for watersports staging or hanging out, and the entire boat is decked out in faux teak vinyl flooring ($946). 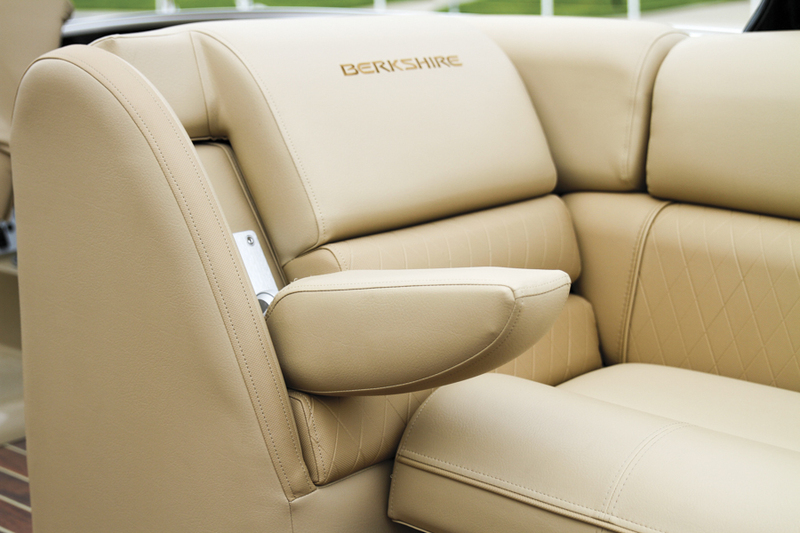 The 25 Sport RFX9’s seating exudes luxury. 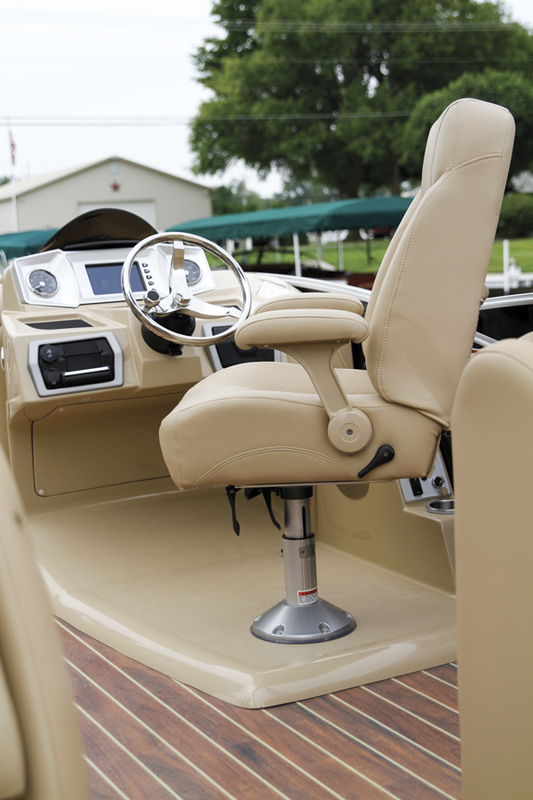 On our test boat, its Soft Touch vinyl was done up in Camel with Bronze accents, giving it a European motor coach feel and look. The twin Lexington-built helm chairs with adjustable-height pedestals have unique armrests that appear to be built to aircraft specs. Four equal-length, mood-lit recliners with cleanly integrated armrests are located in all quadrants and are supported by triple-density foam that is soft yet supportive. For entertaining, there’s a woodgrain cockpit table, and its standard stereo is a Bluetooth Kicker with six lighted speakers plus a subwoofer with a stern remote control. On our boat, there were two more optional rear-firing tower speakers ($713). At the helm is a standard Murphy touchscreen that controls all the boat’s systems, including the rearview camera ($358), which is displayed in color. 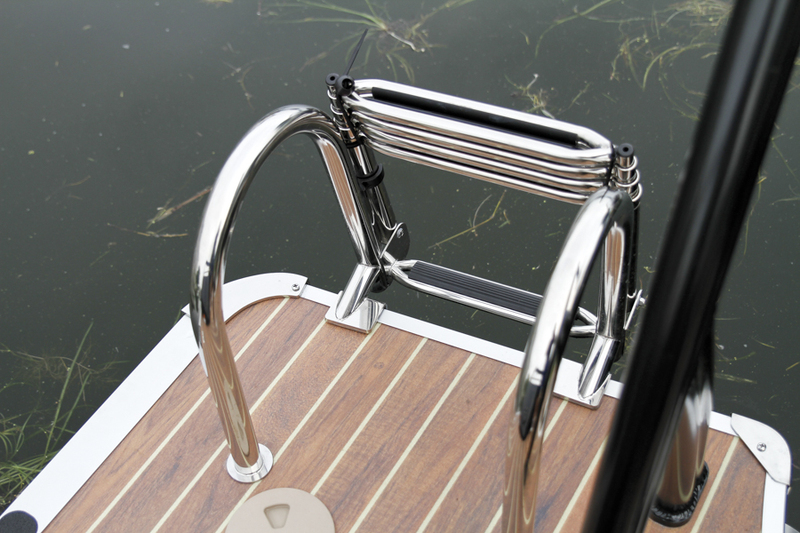 Our boat featured the 3.0+ Performance Package, which bundles together features such as the ski tow, lifting strakes, a running pad, aluminum underskin, a 52-gallon fuel tank and power hydraulic SeaStar steering. This tube package helps it turn impressively, and the driver is aided by the spinner knob on the stainless steel wheel. It was powered by a Mercury Verado 300 Pro, which gave it plenty of kick. On plane in 2.8 seconds, it reached 30 mph in only 6.5 seconds and a top speed of 49.3 mph. LOA: 25 ft., 7 in.